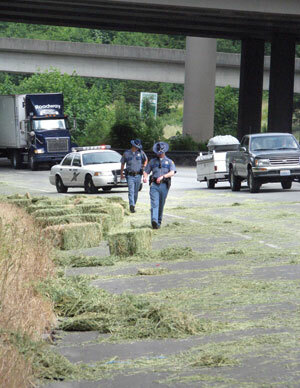 On Jun 11, 2009, a truck and trailer swerved to avoid a car that pulled in front of them and lost dozens of bails of hay on I-90 in Issaquah, WA. The driver and female passenger, who declined to provide their names, were transporting the hay from a local farm to the womans home when a woman in a gold, four-door sedan suddenly cut across lanes and stopped directly in front of the truck. The truck driver was forced to break hard and pull the far right lane to avoid hitting the car. This caused the vehicle to begin to sway and lose their load of hay. 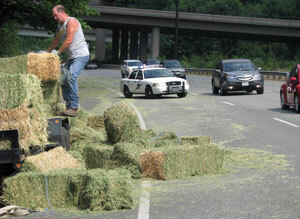 Some of the hay was reloaded onto the truck, but much was spread across about a quarter mile of the highway.